UNRWA is reporting that for the first time in 50 years (dating back roughly to when Israel liberated Gaza in 1967), infant mortality in the Gaza Strip is increasing. It goes without saying that UNRWA blames the Israeli 'blockade' of Gaza. "The number of babies dying before the age of one has consistently gone down over the last decades in Gaza, from 127 per 1,000 live births in 1960 to 20.2 in 2008," the United Nations Relief and Works Agency said in a statement over the weekend. However, "at the last count, in 2013, it had risen to 22.4 per 1,000 live births," UNRWA said. The statement was reported by the Lebanon Daily Star. The agency added that neonatal mortality in Gaza – the number of babies who die before the age of four weeks – rose from 12 per 1,000 live births in 2008 to 20.3 in 2013. In light of the new data, UNRWA intends conducting a new Gaza-specific survey this year. Normally, infant mortality across the region is surveyed every five years. Akihiro Seita, director of UNRWA's health program, said the sudden upswing was unprecedented in the Middle East. 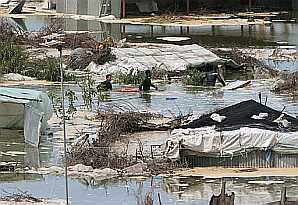 "When the 2013 results from Gaza were first uncovered, UNRWA was alarmed by the apparent increase. So we worked with external independent research groups to examine the data, to ensure the increase could be confirmed," he said. "That is why it took us so long to release these latest figures." While the exact causes of the increased rate of infant mortality are "hard to know," Seiko did not discount Israel's blockade of the Gaza Strip, where close to 45 percent of the population is under 14 years old. "We are very concerned about the impact of the long-term blockade; on health facilities, supplies of medicines and bringing equipment in to Gaza," he said in the statement. But the fact that Hamas routinely spends its money on weapons and terror tunnels instead of sewers and roads, and that the residents of Gaza frequently use their children as human cannon fodder has nothing at all to do with this. For the record, medicines and medical equipment do reach Gaza via COGAT, the health facilities in Gaza are used by Hamas as terror bases, and even as its military headquarters. There's one way for the infant mortality rate in Gaza to immediately drop back to where it was: If Israel were to reoccupy the Strip. That would help even more quickly if the Hamas, Jihad, al-Qaeda etc. leadership were expelled at the same time.